No piece of equipment is as important as a sewing machine to many types of crafting, and only the best machines will produce the best products. 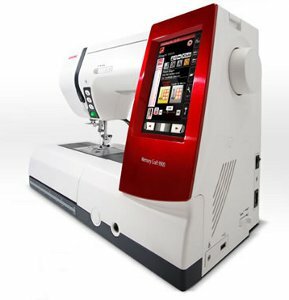 With the Janome Memory Craft 9900, you're receiving a top of the line machine built with every sewist in mind. From the high quality touch screen to the embroidery hoop attachments, you'll be able to design your own needle patterns for home decor projects, your own wearables, and just about anything you can imagine. Stitching at 1000 SPM with very little sound, the Memory Craft 9900 shows an impressive amount of attention paid to detail and innovation. Built in lights throughout the machine make seeing every last detail much easier, and the colorful touch screen increases the level of interaction a sewist can engage in with their machine (there's also an on-screen Sewing Assistant for more support). Janome has worked hard to improve its machines, with the 9900 having a processor with 4 times the speed of the previous model, which supports more detailed embroidery editing. The foot lift is high, and you'll decrease the amount of struggle you have with your bobbins, as there's an improved threading and cover plate, as well as a winding plate that comes with its own blades. One of the most well-known functions of the Memory Craft 9900 is embroidery. You'll never have to worry about big attachments, with the hoops fitting into place easily. You can design your own embroideries with up to 200,000 stitches, use one of the 175 built-in designs, or upload your own. Once you've chosen your colors, the arrows will help you make impressive details for designs of all sizes. The advanced sewing settings are precise and can be executed quickly, but quietly. Preparation is also made more efficient through the machine's design. The bobbin winder plate has its own blades for fast cuts, and the case and cover plate make threading your machine much easier. There are also two easy-to-alternate needle plates that have guide lines to assist in your stitching. Your creative side is also sure to come out with over 200 built-in stitches, as well as ways you can customize and alternate between your designs. Any crafter looking to create sewing, quilting, or other needlework crafts with the best possible quality will want to have a Janome Memory Craft 9900 in their crafting room. This sleek, innovative machine will guide you towards near-perfection from start to finish. I need a new sewing machine. I love this one. I would absolutely love to win this sewing machine! I love to sew, and I've lost everything I owned 3 times in my life...this would really be a dream come true for me. I'm disabled, and on a very limited budget, so owning a machine this nice really would be a fantastic dream...I've always wanted a very nice, new sewing machine! It sounds absolutely fabulous! I would love to have this Janome Memory Craft 9900! I already own and love my little workhorse 3160 QDC.